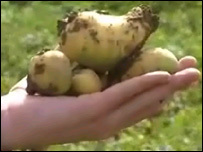 A plan to grow genetically modified potatoes on two trial sites in England has been approved by the government. Defra granted permission for BASF Plant Science to grow the vegetables at field sites in Cambridgeshire and Derbyshire. The crops have been modified to include a gene from a wild species of potato in a bid to make them resistant to blight, a disease costing growers £70m a year. But the Soil Association said it was "a stupid decision" and warned other crops risked contamination by GM. BASF aims to develop potatoes resistant to Phytophthora infestans, a fungal organism that produces late blight. The plant breeder says it has found a trait in a wild potato from a remote valley in the Central American Andes that causes resistance to the fungal organism. The biotechnology firm applied to the Department for Environment, Food and Rural Affairs (Defra) to hold trials at the headquarters of the National Institute of Agricultural Botany (NIAB) in Cambridge and on a farm at Draycott in Derbyshire. The GM potato crops are to be planted next spring, and trials will last several years. BASF said the investigations would take up a maximum of one hectare within a plot of two hectares at each site per year. BASF corporate communications manager Chris Wilson said: "Nothing from these trials will be eaten. The potatoes grown will be tested under carefully controlled conditions and then destroyed. "The possibility of a food crop from it is maybe 10 years down the line." Similar scientific tests are already under way in Germany, Sweden and the Netherlands, but BASF wants to be sure its GM potato variety is resistant to blight under UK growing conditions. Defra held a public consultation on the firm's application between September and October. However, Friends of the Earth GM Campaigner, Clare Oxborrow, said: "These GM trials pose a significant contamination threat to future potato crops. "We don't need GM potatoes and there is no consumer demand for them. Even the county council and the food industry have raised concerns about the impact of these trials." She said the government should instead promote "safe and sustainable agriculture". And the Soil Association's policy director Lord Peter Melchett told BBC Radio Five Live: "Nobody thinks that GM potatoes will seriously be used by British consumers or bought by them." He dismissed the idea scientists would be able to prevent contamination of other crops by GM. "Well, there aren't any such guarantees," he said. Lord Melchett also said the idea it would deal with the problem of blight was "fantasy". "Blight is a disease which evolves very quickly; you knock it back one way, it comes back another," he said. But Professor Philip Dale, an emeritus fellow at the plant-breeding John Innes Centre, hit back at Lord Melchetts' comments. "The Soil Association is opposing this because they have a substantial investment in the commercial future of organic agriculture and they see these kinds of advances in general agriculture to be a threat to the profitability of organic farming. "The negative views on GM crops and foods expressed in the GM Nation public debate (as the report acknowledges) were largely influenced by campaigning groups who for their various reasons wish to stop the evaluation of GM crops. They even wish to deny farmers and consumers the choice to evaluate them."